Commonwealth Games and Other Short Stories. Its been quite a while since posting anything really, well except the frequent 140 character tweet, random Facebook post or mildly humorous youtube clip, so I thought it was about time I did a proper catch up. This is really for me to mark time, and simply take stock, but its cool if you’re interested too. So, I’ve just returned from taking Amélie (now two and a half years old) for a wee walk around our neighbourhood and now enjoying the smell and taste of a 12 year old Highland Park complimented by warm string sounds on the fantastic new album ‘Lights in the Sky’ by Peter Gregson. Its a good time to post something. Firstly, the Commonwealth Games have now left the wonderfully proud city of Glasgow. What an excellent time we had. We were lucky enough to catch the rhythmic gymnastics on day one, and then see my good friend and colleague Louise Mather compete for Team Scotland in the weightlifting. Over the two weeks of the games being hosted here, we managed to get out to see loads of great events during the festival that surrounded the sporting events. We visited the newly refurbished Kelvingrove Bandstand, Glasgow Green, and some events further out in the city. Some of the best bits were; Remember Remember, Rachel Sermanni, James Grant, Commonwealth Youth Dance Festival, James Yorkston, Errors, and Admiral Fallow. And all for free. Over the last year, I’ve been more involved in the national music mentoring project that I work on as a coordinator. Through hiring someone else to take on most of the admin side of the project, it has allowed me more time to do some of the actual mentoring, and throughout the year I’ve come to realise that its that part of the job that I love the most. Hearing the music and ambitions of young people becoming something. Offering advise and a helping hand. Listening to problems and difficulties whether music related or not. Its been a great time of learning for me as well as the talented young people I work with. I have the unique opportunity in my job to programme some excellent events and workshops and have the privilege to have met and worked with some wonderful people throughout the last few years of doing it. “So, what is it that you actually do?”, Did I not answer it? Another piece of work I am proud of taking part in was the recent album by Findlay Napier and Chris Sherburn. I was asked by Findlay if I would be able to design the artwork for the album, and the theme was all based around a boat, well the album is called ‘Two Men on a Boat’, so I used the photography they had from the recording sessions and turned it around for them. I was proud to see the final result, and the album is great too. Yes, I had given into the trend and decided to grow a beard. A belter you might say. It didn’t go down as well as expected with family and friends, Joni didn’t mind it, Amélie liked it i think, and I loved it. So its off just now for the summer holiday to Kefalos in Kos we are preparing for, but I’m sure it will be back in time for winter. It turns out I shave more when I have a beard too, mainly to keep it tidy and be absolutely sure that people understand that its a BEARD, and i’ve not just been lazy with my shaving routine. Lastly, I’m still keeping up with cycling to work everyday, its a 15 mile commute (return) so it keeps me fit and saves me a fortune on bus fares. I also love the way cycling makes me feel, I have more energy, I can go at my own pace, I feel the sun on my face and the rain on my back. Also, over the last few months I’ve been exceptionally lucky. 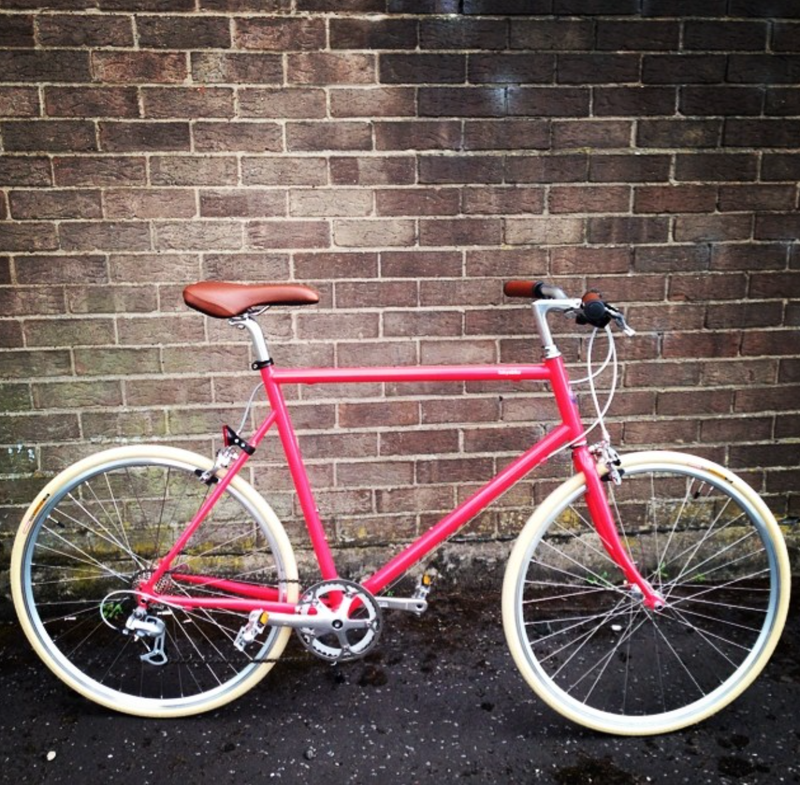 I’ve won a track pump from the Glasgow Bike Station, and a Tokyo Bike. Both are very handy. Well, nearly lastly. . We’ve also started listening to vinyl at home. I can highly recommend it, it keeps you in the same room and forces you to listen and not watch TV or skip tracks on your CD or iPod. I’ve also began reading a great book on the early days of soul called ‘Sweet Soul Music’ by Peter Guralnick. We’ve also been really enjoying the TV series of Fargo. Oh, and I’m voting YES in the Independence Referendum. Until we meet again. . . Since last years’ excellent outing through the best food and drink establishments in the city, I was extremely excited about this year. It came as a surprise that the organisers had announced the locations of the host restaurants and pubs beforehand as it almost added something to the mystique of the event that we in fact never knew last year. Once we got started and met up at the Blythswood Hotel to have some coffee and cakes before setting off downhill towards the Merchant City to have Hendricks gin, and Stornoway black pudding at Cafe Gandolfi. We passed on then over to West Brewery for some fabulous beer in the sunshine. After this light refreshment we made our merry way to the Riverside museum for what seemed like a pointless exercise as no one seemed to know why we were there? Pushing on (no against the clock it would seem) we entered the westend to visit the Crabshakk (for Oysters) and The Finnieston (for a beautiful Ardbeg / pineapple cocktail). And, then we headed over to Brewdog for more craft beer and then further west to Siempre Cafe for oatcakes with mackerel. By this point, personally I had already made my mind up that the previous year was better, more organised and a little bit more fun. We seemed to be rushing around a little to much and the group was more split than the previous year. Although we did have more stops and some more interesting ones; The Tall Ship, and then The Hillhead Bookclub, when we arrived at both these establishments there were no more drinks served, they had run out. . . poor planning, or just not enough poured? Last stop was the Big Slope where we had a great bite to eat with generous portions and set off to the Blythswood for the finale and raffle. All in all a great day, but as mentioned earlier, I feel most of the day was planned around a somewhat pointless spot at the STV building and then to make the Hillhead Bookclub for a gentleman ‘rapper’ who actually wasn’t very good. However its more important that we look at the fun we had, the money raised for the charity and lastly the awareness of Harris Tweed. Tally Ho! I decided to get out to photograph the British Cycling National Road Racing Championships today as they were in Glasgow. I pedalled over to Byres Road through the light wind and soft rain to try to capture some of the fastest cyclists in the world as they passed through the closed streets of Glasgow. Firstly I got them on the first lap at the turn on to Byres Road, and then decided to catch the second lap as the riders grimaced up Great George Street as they headed back into the city centre. It was a great atmosphere and plenty of people were there cheering the riders on as they pedalled through the streets, a good day for cycling in Scotland. We had a family trip down to the Riverside Museum today, it was much quieter than the last time we visited so we spent more time wandering around, taking photographs and checking out the various types of transport. I first met Ali Campbell at the very first ever Tartan Ride in Glasgow at the tail end of 2012, he and I have a mutual friend and I took some photographs at the event which I then sent to the organisers via facebook. It was a fun event and a messy ride home through the ice and cold. And then I came across this idea: April Fool 900, an idea dreamed up by Ali that involved a 900 mile ride, single-speed style. You can read more about the ride here, and also enjoy the great video that has been made for the event.